"...any law that denies you the means to defend yourself against others armed with those same means is an unjust law and undeserving of compliance, albeit compliance makes you a criminal by definition." Viva la frontier justice. To ensure that people have the means to defend themselves, they also have a lucrative gun-running business, a part of their "shade trade" of illegal enterprises. The family organization is split between Texas and Mexico City; the home of the Mexican side of their family (known as Los Jaguaros), and the two come together in this book when one of the American cousins is kidnapped as part of a 10-person wedding party in Mexico City. An ambitious leader of a small Mexico City gang wants to be recognized for his evil talents, so he demands a ransom of five million dollars from the parents of the bride and the groom. He figures this will put him on the map with the Zetas, the infamous cartel -- maybe he can buy his way into their favor with part of the money. Kidnapping the Wolfe girl was, unbeknownst to him, pretty stupid on his part because both sides of the family are coming to get her back. The gang leader has no clue what he's in for. Macho and manly are the words that ran through my head while I was reading this briskly-paced revenge-thriller told from multiple points of view -- yes, that's a bit sexist, but it's the truth. One of ours has been taken -- screw the cops, we'll go get her ourselves. The Wolfes certainly have the resources to do it, and the family takes care of its own. In fact, House of the Wolfe is part of an entire family saga (which I haven't read) that goes back in time while exploring the family history. There are two women who feature prominently in this novel -- both are kickass Lisbeth Salander types, likely there to draw female readership -- but the people with the biggest roles are definitely the men, and overall it's a book that I think will draw way more male readers than female. As far as thrillers go, anyone who loves them will find House of Wolfe irresistible. It's filled with action: kidnapping, daring escape attempts, chases, explosions, lots of gunplay, death in fiery pits, feral dogs, even torture -- everything a diehard thriller reader could possibly want. It speaks to the need to be self-sufficient and to have enough money to buy your way into positions of power and control -- in that sense, both bad guys and "good" guys have the same goal, the "good" ones having achieved it long ago. And to his credit, the author had one major storyline and didn't go off the rails (unlike so many authors do) trying to incorporate everything under the sun in this book. 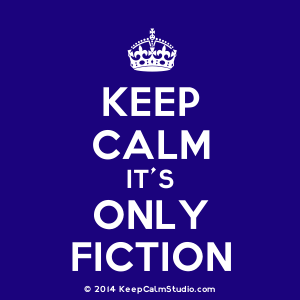 Here's another case for me where book does not match reader -- I'm just not a thriller person. 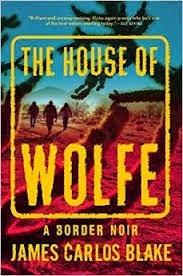 I thought by the description of the novel that it was going to focus on Mexican cartels along the border (a topic that interests me), since its subtitle is "A Border Noir." The cartels that work along the border are sort of sidelined except in terms of one man's ambition to get a foot in the Zeta door, and with the exception of the first chapter, the action takes place in Mexico City, which is nowhere near the border. Nor is this book what I'd call noir. When all is said and done, it comes down to a story of family justice -- and it's a showcase for mega amounts of violence.